If you're a road racing fan like me, you probably watched the American Le Mans Series' Northeast Grand Prix this Summer. 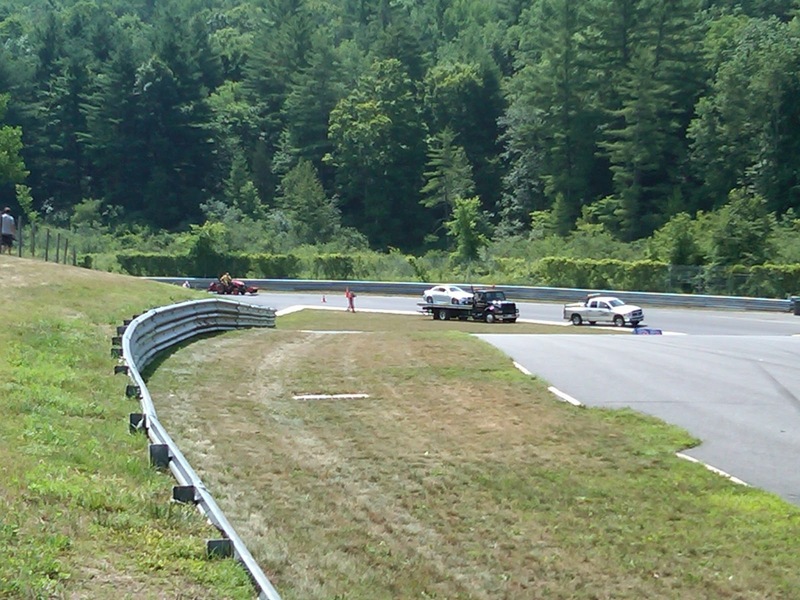 Maybe you sat on the couch with a cold one and caught the race in progress on ESPN2, or maybe you were at Lime Rock and caught it live, but how close to the action did you get? Did you get to feel the percussive shot of a GT Corvette's upshift hit you in the chest as it accelerated up No-name Straight? Did you get chunks of rubber hitting you in the arm and chest as Patrick Long did his qualifying laps in the Lizard Motorsports Porsche? Or maybe you got to tattle on one of the Patron Ferraris as it blew the Uphill chicane, took the classic course's Uphill path, and then hit the tire wall slalom meant to slow down scofflaws that didn't make the 90 degree right-hander like their fellow competitors did... OK, like some of their competitors did. and catch on fire during show laps, did you? Flaggers did! What Do Flaggers Really Do? You'd be this close to the racing action, experiencing some of the most intense times of your life, and doing it ticket-free, just as long as you are a qualified Sports Car Club of America (SCCA) flagger working the event. I've told friends, family, and co-workers about my flagging hobby, but I never get the sense anyone really understands what I do, or how exciting it can be. If you've watched a road race in most any series, or if you've done some track days with your own car, you're probably familiar with the flagger, or corner marshal, and what they do: dressed in all white, they use flags to communicate to the drivers who are on track, and sometimes to drivers who have gone off track. It's relatively simple to become a flagger, but it can take years of experience to become a good one. 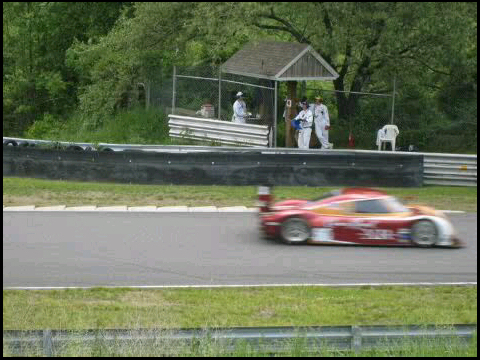 during last year's Grand Am race at LRP. One of the easiest ways to get started is to join your local SCCA region as a member, then find out who is the Flagging & Communication chief for your region. They'll make sure you get the information you need to get started. You'll typically start out volunteering for SCCA club races, where they'll team you up with experienced flaggers who can show you the ropes. If you know your flags and what they're for, you have a good start. After you've proven yourself as a reliable team member for flagging crews, you'll have the chance to volunteer for other series that SCCA provides flaggers for. One the perks of being a flagger is you get unlimited access to the pits. 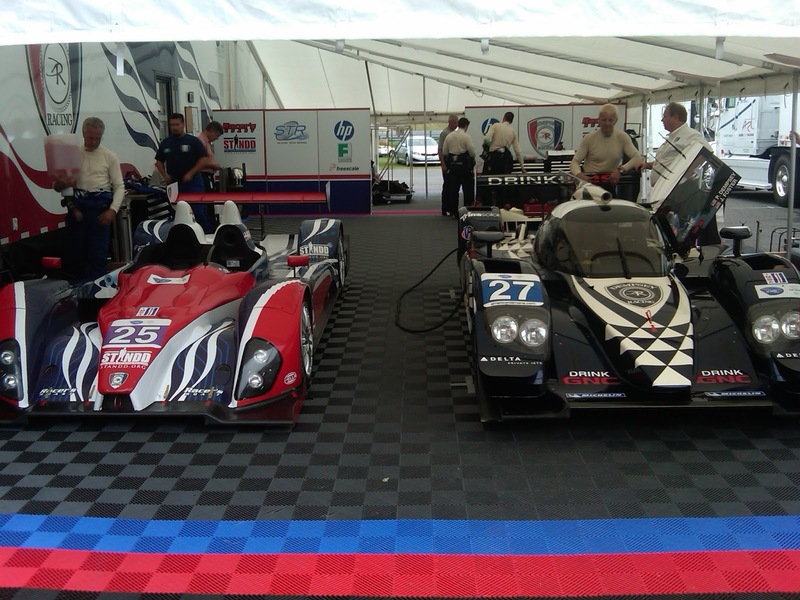 Pictured on the left is the 25 LMP Challenge car that crashed! The ALMS Northeast Grand Prix Has Some Cachet! 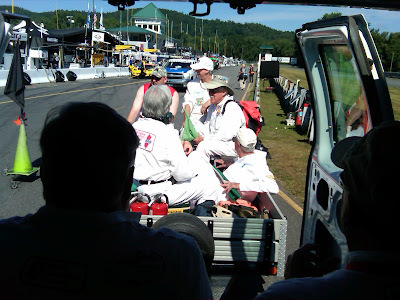 This year's Northeast Grand Prix was my first ALMS race I've ever attended, either as a spectator or a flagger. 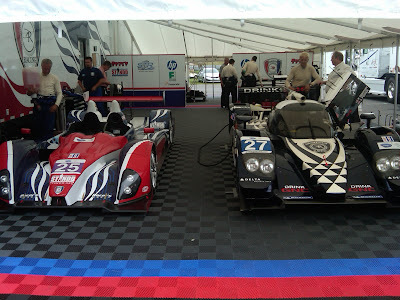 While I love Grand Am races, I have to admit there is something special about ALMS. The cachet of the race is undeniable - money is very evident in the paddock, whether in the form of the well-kept and highly maintained racing machinery being attended to by skilled crews under high-end canopies attached to enormous race trailers, or the long row of luxurious RV coaches that house the star drivers and the owner entourages. Walking around among the teams, you're liable to pass by Bill Auberlen as he chats with some fans and signs autographs, or step aside as Bobby Rahal rides by on his pit bike. I can't tell you either of the Falken Tire girls' names, but their outfits are enough to make them stars. A flagger's life would be incomplete without the Falken Girls! Flagging ALMS, whether it was practice, qualifying, or the race itself, was a bit nerve-wracking. The ALMS operates under FIA flag rules, so it's slightly different from your usual SCCA flagging rules: if a flag station has a waving yellow, the flag station prior to them is supposed to show a standing yellow; whenever a flag station shows a yellow flag, the following flag station is to show a waving green. Add on top of that you need to keep track of the top 3, 4, or 5 cars in the race in order to show slower traffic the blue passing flag and help the leaders fight their way through the field, and it can be mentally demanding. That's on top of the normal chores a flagger has for every race: potentially responding to a crash or fire if a competitor has problems in your sector, keeping a constant eye on your section of the track for the first signs of an incident if you're a yellow flagger, keeping an eye out for those leaders if you're a blue flagger, and calmly and precisely calling in any incident that occurs in your sector if you're responsible for the radio communication to Race Control. It can be a bit stressful at times, but at the end of the day you realize you feel exhilarated at having been a part of the spectacle, and possess a sense of accomplishment in helping the racers put on the best show they could. For this race, I was stationed at a temporary flag station at the top of The Uphill, driver's right, safely out of camera view (I DVR'd the race and checked). While I was yellow flagging, we had the # 25 LMP Challenge car slowly spin and crash at our feet, which caused us to jump back from the edge of the earthen bank we stood upon. I was able to look down into the cockpit as the driver angrily tried to get the car restarted and drove away as the carbon fiber aero aids in his right rear corner came loose and fell to the track. 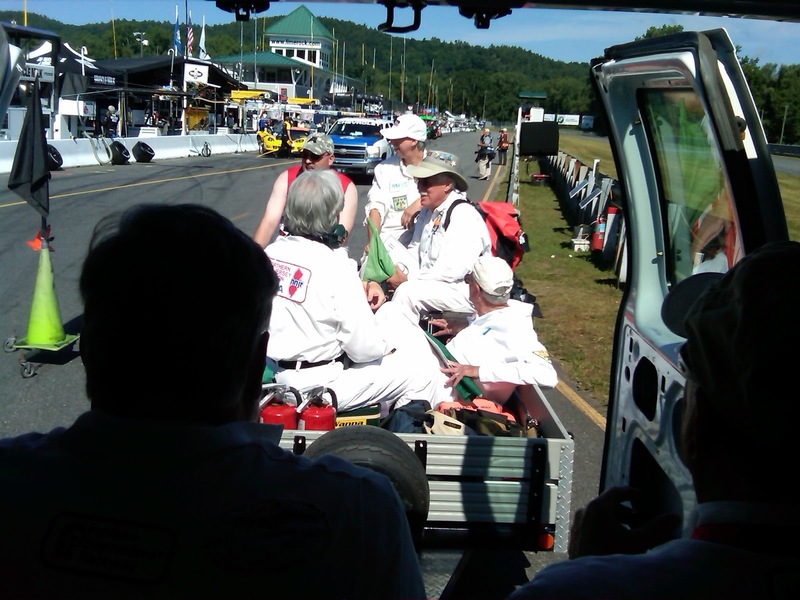 I know, it sounds a bit "dicey" for us, but it wasn't as bad as it sounds, as we were 4 feet above the track, and the bank had guardrails keeping the cars on track. The other interesting incident we had happen in front of us was the previously mentioned # 01 Patron Ferrari hitting a tire wall and pushing it down the shortcut about 40 feet. There were 3 small tire walls, arranged in a left-right-left arrangement that were meant to form a tight slalom and slow a car down enough so they would not gain a competitive advantage over those cars that successfully navigated through the racecourse's chicane. The tirewall that was hit ended up lining up with the last tirewall of the slalom, and thus effectively blocked the exit of the shortcut. Transporting flaggers to corner stations or apple-pickers - you decide! I called in the infraction by the Patron Ferrari to Race Control, who tried to understand just where the tirewalls now sat. Just as I finished assuring them the tirewall wasn't actually out on the racecourse proper but would need to be dealt with, a Porsche GT Cup car came up the shortcut, having also missed entering the chicane. I called this in to Race Control, realizing the unfortunate Cup car was about to discover the tire wall now blocked the exit of the shortcut and couldn't be passed through. Sure enough, the car came to a halt on the course while the poor driver tried to understand what was happening. As I told Race Control of the dilemma, the driver fortunately figured out he couldn't afford to just sit there, and he went driver's right onto the grass and got around the obstacle to continue his race. Race Control called for a full course yellow seconds later and dispatched one of the ALMS Safety crews to repair the slalom and return the tirewalls to their rightful positions. That's something you didn't get to do while sitting on your couch, now, did you? All workers get a free meal and beer at the end of race day. The stories you share and the camaraderie alone are worth all the work we put in throughout the day! For more on what you can expect as a new flagger, see this excellent write-up put together by very experienced SCCA flaggers. To find out more about the SCCA, visit www.scca.org. The wife mentioned something about this weekend being our wedding anniversary and that not being compatible with flagging for the Historics this coming weekend. ;) I hope the weather is good and your day is safe! EJ, you cut Peter some slack out there on the track, OK? Professional flagger.....does that mean you get paid? I should join your region. A free meal and a free beer at the end of the day. Sometimes a t-shirt or series patch, too. That's the extent of your pay, as it sounds like you're well aware. You'll have to talk to the blog owner who took it upon himself to title this as "Professional". I have heard of LRP flaggers who work car club track days getting paid, but those are guys who freelance outside of the SCCA.